Technical director Mike Rigg admits Burnley were frustrated in their efforts to bring in a number of players in January. 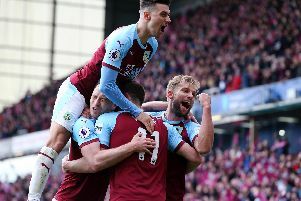 But the 48-year-old feels the window could be considered a success of sorts, providing the club retain their Premier League status, with money generated from the sale of Sam Vokes added to the pot. Striker Vokes was sold to Stoke City for a fee believed to be around £10m, with Wolves due 25% of the profit following his £350,000 move from Molineux in the summer of 2012. “There were all kinds of players we were chasing, but in January every player that you want, you can’t get, and every player that you can get, you don’t want. The Sam Vokes and Peter Crouch deal was a very simple win, win. Rigg, who has been technical director with the FA of Wales, Blackburn Rovers’ chief scout, head of player acquisition at Manchester City, technical director at QPR, head of talent identification at the Football Association, and chief footballing officer at Fulham, hadn’t been expected to make an immediate impact in January, as Sean Dyche said: “He’s not been brought in for the next three months, he’s been brought in for a long period to go from window to window. Asked whether the window could be considered a success, Rigg mused: “Are we any worse off? I would say no. “In terms of financially being able to reinvest what Sam Vokes has contributed to this club, which has been incredible, and we have finances towards the window in the summer, then you can regard it as a success. “What we didn’t do was we didn’t lose any players that were important to us, and yes we were chasing a lot of players that we wanted and that were on our list, but chasing and being able to get are two completely different things.